So I heard you liked Cyberse Structure Decks? Hello Pojo Readers, Crunch$G here once again to tell you what you should know about another Cyberse Related Deck. 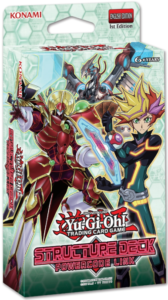 So far we’ve had the 2017 and 2018 Starter Decks along with the Cyberse Link Structure Deck and we still got one more known Cyberse Deck after this, so hopefully after this the Structure Decks that aren’t Retrained Structure Decks have different archetypes. Until then we got some more Cyberse support to talk about, and some of which is worthy of being played in the Cyberse Deck, so with this out of the way, let’s get started. Yeah, I know this is obvious, but it is basically what this deck is about, Cyberse support. First off, we got the new Code Talker monster in Powercode Talker who can negate a monster’s effects once per turn as well as tribute a monster it points to while it is battling to double the ATK power, it does require 3 Monsters though as a Link-3 and isn’t like most other Link-3s that need 2+ Monsters instead, but it is still generic and still a solid Code Talker. We also got a generic Link-2 and Link-3 in LANphorhynchus and Traffic Ghost that only have arrows pointing down but no effects in return, but they are generic with requirements of 2 and 3 monsters respectively, the Link-2 might be worth having if your deck has an assortment of different Attributes where the Attribute Links won’t work. Datacorn is a Level 1 that gives you a Token when it is Special Summoned. Garbage Collector returns a Main Deck monster to your hand to summon another monster from your deck with the same Level. 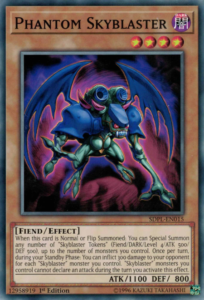 Sea Archiver can be Special Summoned from the hand or GY when a monster is summoned to a zone a Link Monster points to. Flame Bufferlo when it leaves the field lets you discard a Cyberse Monster to draw 2 cards. 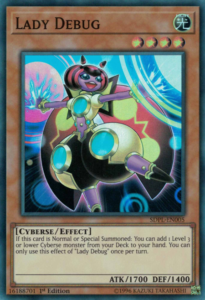 Lady Debug lets you search for a Level 3 or lower Cyberse Monster. 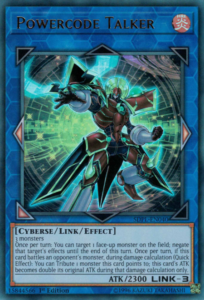 Antialian lets you Normal Summon another Cyberse monster if it battled during the Battle Phase and lets you draw if your opponent uses an effect to get rid of it. Storm Cipher is basically immune to monsters in the Extra Monster Zone. Segmental Dragon is a 2600 ATK Level 7 that can be Normal Summoned or Set without Tribute and during either player’s turn, you can destroy the face-up Normal Summoned/Set Segmental Dragon to destroy all monsters your opponent controls with ATK less than or equal to the ATK Segmental had on the field. Cyberse Gadget on Normal Summon can revive a Level 2 or lower Cyberse and when it is sent from the field to the GY, you can summon a Token. 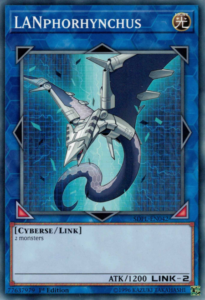 Cynet Storm lets Linked Monsters gain 500 ATK and DEF, prevents your Link Summons from being negated, and can potentially summon a random Cyberse Link Monster from the Extra Deck when you take 2000 or more damage. Finally Packet Link can let you summon any Level 2 or lower monsters with different names from your hand, deck, or GY to zones Link Monsters point to. There are a ton of new cards in this deck, but in my opinion, the ones worth having for Cyberse decks are Powercode Talker, Sea Archiver, Flame Bufferlo, Lady Debug, and Cyberse Gadget. You can play around with Cynet Storm if you wish and some decks might want to have LANphorhynchus. Sadly Droll & Lock Bird has been removed from this deck, so there goes the best reprint, but there are still some good reprints worth knowing about. Juragedo got its first reprint ever. There are two copies of Reborn Tengu in this deck, which might come in handy later on in the Link Era. Skull Meister is reprinted in this deck as a common, which is always a good hand trap to have. Phantom Skyblaster gets a budget reprint that isn’t in an OTS Pack. Effect Veiler getting reprinted is never bad. Scapegoat is an amazing card to have for Link Summoning if it never gets banned. Safe Zone also has its first reprint outside of an Astral Pack. Finally, Debunk has its first reprint that will likely remain budget. The reprints would of probably been better with Droll & Lock Bird and Grinder Golem if that wasn’t Limited, but the reprints are still solid overall. Simply put, this is like every other Cyberse Deck so far. If you are interesting in playing the deck, then this Structure Deck has several good cards in it that you’ll want to play the deck, but if you are not interested in the theme, then there are only a few things in here that are worth it for you like the generic vanilla Link-2 and a few of the reprints. It isn’t a bad Structure Deck, it has honestly really good Cyberse Support and the next Cyberse Deck has even better cards for the theme, just the Cyberse theme isn’t for everyone really and it isn’t the most competitive. Now, it doesn’t have to be, but if you are looking for a competitive deck, then this might not be for you yet.